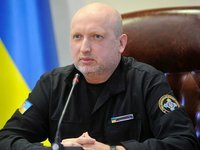 Secretary of the National Security and Defense Council (NSDC) of Ukraine Oleksandr Turchynov has said the statement of the Russian side that the missile from which the passenger Boeing of Malaysia Airlines was shot down in 2014 over Donbas was allegedly of Ukrainian origin is false. "The statement of the Russian Federation about the alleged Ukrainian trace of the missile that downed the MH17 is another unsuccessful Kremlin fake to cover up its crime, which has already been proven both by an official investigation and by independent expert groups," Turchynov told Interfax-Ukraine in Kyiv on Monday, commenting on the statement of the Russian Defense Ministry. Later in the day, the NSDC's press service published a comment by Turchynov, in which he says that the Russian military and political leadership will not be able to hide from responsibility for the downed Boeing. "As far as I remember, this is perhaps the ninth or tenth theory, which the Russian military and politicians are trying to impose on the world community so as to hide their involvement in this terrible crime," the NSDC's press service quoted Turchynov as saying. He recalled that earlier Russia spoke about a Spanish air traffic controller who supposedly saw on the radar a Ukrainian fighter aircraft and air-to-air missiles approaching the Boeing and about the so-called former serviceman who allegedly was at the airfield from which a Ukrainian fighter aircraft took off to shoot down the MH17. "And a lot of other lies," Turchynov said. "These dirty fantasies, dirty fakes have only one goal of hiding true criminals, but the fact that the true criminals are in the Russian military and political leadership has already been proven both by an official investigation and by independent experts," he said. Earlier on Monday, head of the Main Missile and Artillery Directorate of the Russian Defense Ministry Nikolai Parshin said that the missile of the Buk anti-aircraft missile system, which shot down the Malaysian Boeing MH17 in 2014, was manufactured in Dolgoprudny outside Moscow in 1986 and sent off to Ukraine, from where it no longer returned to Russia.